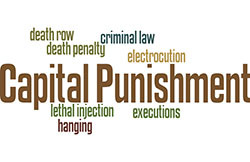 Guide to background sources, search terms, articles, books, and other sources on capital punishment. Welcome! This guide will serve as a starting point for Shippensburg University students wishing to conduct research on various aspects of the national debate over capital punishment. You will find sources that introduce you to your topic and keep you up-to-date with links to news articles, research websites, journal articles, research reports and other selected key publications, books & E-books, research organizations and advocacy groups, data sources, and links to general and specialized databases for further research. Historical polling data on American opinions on the death penalty. This book explodes this myth that America's founders were ardent advocates of capital punishment. Instead it shows the founders' conflicting and ambivalent views on capital punishment. Cruel and Unusual takes the reader back in time to show how the indiscriminate use of executions gave way to a more enlightened approach, one that has been evolving ever since. America's Death Penalty examines the historical and theoretical assumptions that have underpinned the discussion of capital punishment in the United States today. The authors use comparative and historical investigations of both Europe and America in order to cast fresh light on familiar questions about the meaning of capital punishment. Is life without parole the perfect compromise to the death penalty? Or is it as ethically fraught as capital punishment? This books brings together original work by prominent scholars in an effort to better understand the growth of life without parole and its social, cultural, political, and legal meanings. Urbina's consideration of capital punishment seeks to examine racial and ethnic differences, stressing how Latinos' and Latinas' experiences are distinct from those of Caucasians and African Americans. In considering Latinos he focuses on the problem of lack of data and addresses it through several means. The death penalty has largely disappeared as a national legislative issue and the Supreme Court has mainly bowed out, leaving the states at the cutting edge of abolition politics. This essential guide presents and explains the changing political and cultural challenges to capital punishment at the state level. Despite its comprehensive abolition elsewhere in the Western world, capital punishment continues in dozens of American states, a fact that is frequently discussed but rarely understood. The same puzzlement surrounds the peculiar form that American capital punishment now takes, with its uneven application, its seemingly endless delays, and the uncertainty of its ever being carried out in individual cases, none of which seem conducive to effective crime control or criminal justice. On April 19, 1995, Timothy McVeigh detonated a two-ton truck bomb that felled the Alfred P. Murrah Federal Building in Oklahoma City, killing 168 people. On June 11, 2001, an unprecedented 242 witnesses watched him die by lethal injection. Madeira uses the Oklahoma City bombing as a case study to explore how family members and other survivors come to terms with mass murder. Cases are organized thematically under headings such as competency, constitutionality, due process, jury selection, and means of execution, among many others. This organization is the major research and advocacy group concerning capital punishment. While "DPIC seeks the abolition of capital punishment" it "offers analysis in a nonpolemical fashion" - ACRL News. News, legal cases, and research reports are tracked extensively and searchable by a full range of issues (i.e. race, victims, deterrence). It also includes a searchable database of every execution since 1977. This organization combines research and advocacy. It includes a fully searchable worldwide database of executions, laws, extensive details about capital punishment worldwide. Use this search tool to find important advocacy websites both for and against capital punishment. There are fewer current advocacy organizations of national stature advocating for capital punishment than against it. This advocacy organization works to "assure that people guilty of committing crimes receive swift and certain punishment in an orderly and constitutional manner" -- website. The main activity of the group is to file amicus briefs in legal cases in support of its mission, including retention of capital punishment. Search the Crime section of the Heritage Foundation website with terms such as "death penalty" or "capital punishment". Death Penalty site of a major international human rights advocacy organization. Fully searchable database of every execution (1400+) in the United States since 1977. Historical polling data for American opinions on capital punishment. This library database serves as a search engine to search most library databases at the same time, including magazine and journal databases, e-book collections, and the library catalog. News databases are not included in a comprehensive way. Supplement this with direct searching of ProQuest Newstand and Lexis Nexis Academic. Search results default to items that the library owns, either in online or print format. Remove the "Available in Library Collection" limiter to retrieve items available through interlibrary loan. Academic Search Complete is our most important general database. covering all subject areas. It is useful for research in all classes, as it includes 26+ million newspaper, magazine, and journal articles, with 50% of these immediately available in full-text. Contents indexed in Ship Library Discovery Search. One of the most comprehensive news databases in the world, Newstand provides "access to the full text of over 1300 newspapers, news websites and blogs from leading publishers throughout the world". Together with LexisNexis Academic, it is our primary source for news information. This library database is one of the world's largest full-text databases, including very extensive news, legal, and business information. Along with ProQuest Newstand, it is our primary source of news information. Covers scholarly publications in sociology, social work, criminal justice, and related fields. Contains >2.5 million articles and other materials (70% in full text) with deep coverage from 1960 and some back to 1882. Provides citations to some 550,000+ articles in academic journals and professional magazines in criminal justice and related fields. Full text is immediately available for 70% of the articles. Use this search tool to find high quality web sources for your research. You can limit by In-Depth Journalism, Newpaper Topic Guides, Science News, CRS (Congressional Research Service) Reports, and Web Directories. Please Note: Several ads will appear first in the results list. ProPublica is a freely available website produced by a major online non-profit news organization dedicated to in-depth investigative reporting about current issues in the public interest. ProPublica features two kinds of reporting: Investigations, which include a series of in-depth articles about a topic (often between 15 and 30 articles - major topics range from dozens to 100+ articles). MuckReads are shorter reports featuring investigative journalism from other news agencies. Major areas of interest include, among others: healthcare and the health industry, fracking, censorship, money and politics, and financial and economic issues. Reveal is a freely available website and the online media platform for the Center for Investigative Journalism, a major online non-profit news organization, founded in 1977, and dedicated to in-depth investigative reporting about current issues in the public interest. They publish series of investigative reports on a topic (typically between 10 and 20). Major areas of coverage include: criminal justice, the environment, guns, health care, labor and employment, national security, religion, surveillance and privacy, and veterans. The Center for Public Integrity is a freely available website produced by a major online non-profit news organization dedicated to in-depth investigative reporting about current issues in the public interest, with a special focus on accountability and fairness, especially in terms of the role and influence of money. Topics featured include politics and elections, national security business, the environment, juvenile justice and health. NPR is one of the most important freely-available sources of investigative journalism. It includes excellent topical pages but these are not easily browseable on the website. Use the High Quality Web Source Finder search box to locate the topical pages for your issue. This very high quality web site, located at Harvard's Shorenstein Center on Media, Politics and Public Policy and sponsored by leading academic journalism programs, guides journalists and other researchers to find scholarly sources related to many of the most important topics in the news. Whenever the source is not available in full-text, use the discovery layer or library A-Z journal list to get library access to the article or to order it on interlibrary loan. A number of important national newspapers have topic or issue sections of their website that bring together all the paper's articles on particular topics. The leading example of this is "Times Topics" from the New York Times. Each topic guide/section has a search tool that lets you refine your search. Unfortunately, these sections are often not easy to browse or locate on the newspaper websites. Use the "High Quality Web Source Finder" search box above to search for your topic. Then choose the Newspaper Topic Guides tab to look for these in the New York Times, Los Angeles Times, and Chicago Tribune. If you should hit a pay wall when browsing these newspapers, simply search for articles from any of these three papers using the ProQuest Newstand library database. The Congressional Research Service (CRS) is the public policy research division of Congress. It issues detailed research reports on a very wide range of issues. CRS doesn't maintain its own website, but its reports are available through several organizations and libraries. The University of North Texas maintains a freely available digital library collection of Congressional Research Service reports, with the goal "to provide integrated, searchable access to many of the full-text CRS reports that have been available at a variety of different web sites since 1990" -- website. Best search tool for finding CRS reports. Update holdings of specific reports through the Federation of American Scientists or through a web search on the name of a report. As a public service, the Federation of American Scientists maintains this free archive of CRS reports. Website that attempts to make all CRS reports easily available to the public. The result of a bi-partisan movement to get Congress to pass a bill requiring open access. This freely available website produced by the Vanderbilt University Libraries provides an alphabetical topical directory to important websites on some 50 current issues. These guide pages typically include sections for these kinds of web resources: Basic Sites, Government, International, News, Statistics, Interest Groups and Research Centers and Other Educational Sites.